Bikaner in Western Rajasthan is home to the largest camel breeding farm in Asia and known as the Camel Capital of India hosts a unique Camel Festival that has become quite a tourist attraction. Organized by the Department of Tourism, Art and Culture, Camel Festival is a sought after yearly event in Rajasthan that Bikaner celebrates in honor of the ship of the desert, Camel. The Festival is a two day affair, held in January. Camel Festival in Bikaner is definitely a must visit event if you are the kind who enjoy the old rustic charm of medieval royal India coupled with a festival which dons a slight touch & essence of rural merriment. The festival is a two day affair & the parade ‘Shobha Yatra’ which marks the start of the festival from Junagarh Fort to Karni Singh Stadium is as grandeur as a royal wedding parade of some prince of a princely state of Rajasthan. It is a lively and colorful procession of beautifully adorned camels, traditionally clad Rajasthani locals, folk dancers, performers and army bagpiper bands reciting by the side of the red sandstone backdrop of majestic Junagarh Fort. 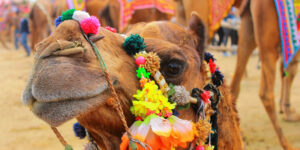 2 Camel competitions & performances: The festival offers spectacular displays of decked up camels dressed in vibrant bridles, traditional necklaces and heavy anklets showing off wonderful footwork to the lovely tunes on desert sands. Some interesting competitions during the festival were beauty pageants for camels including which one was the best-dressed and had the best hairdo! No-where else in the world except Rajasthan, one can see such beautifully festooned camels. 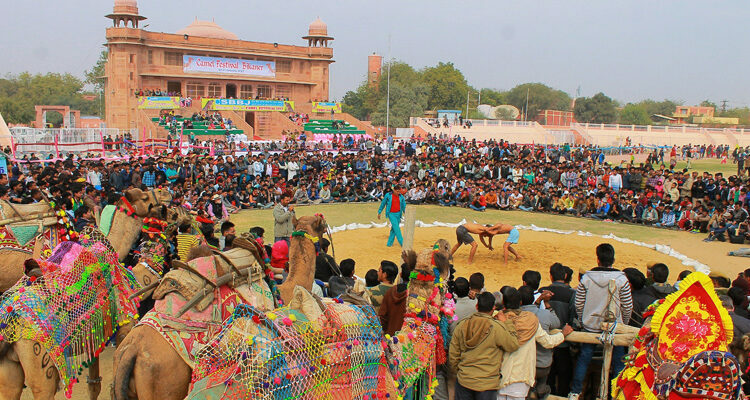 3 Sports competitions: Apart from the stunning camel performances & cultural activities, the festivities included local sports competitions amongst local and foreign visitors which kept the festival goers engaged. 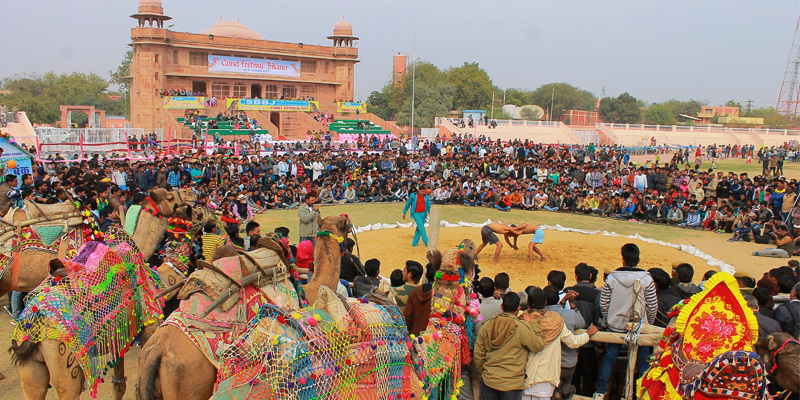 The competitions included free-style wrestling, water pot race, tug of war, kabbadi and kho-kho competitions between the Indian guests and the foreign visitors. With Sultan and Dangal songs as background scores, the wrestling matches in-particular supplemented enthusiasm amongst populace and added swag to the festival. 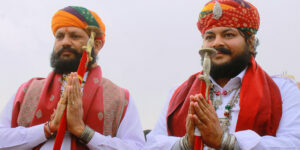 4 Cultural performances: Though the festival is exclusively organized to venerate the desert ship, the Camels, the traditional Rajasthani folk music and dance performances added charm and glamour to the festival. The locals display their skills through captivating performances and pulsating dances on soulful folk music all of which are nothing short of spectacular. 5 Formidable Forts and Museums: Though Bikaner is not famous for its tranquil lakes and forts but this rustic town is actually gateway to some elegant palaces and formidable forts, the most famous being Junagarh and Gajner Forts. Alongside two eventful days at the festival, one can look at exploring the city. Junagarh Fort can easily be covered on the second day, during the morning hours before the start of the festival. With just one extra day squeezed in, Gajner Fort along with Desert Camel Safari and Karni Mata Mandir can be covered which happens to be the biggest attractions of Bikaner. 6 Rajasthani Cuisine: Rajasthan is no disappointment for those who view good food as an essential element of a happy holiday. The local Rajasthani dishes specially dal baati churma and Rajasthani thali particularly with besan gatte ki sabzi appetizes all the food lovers. While in Bikaner, one should also try out the lip-smacking lassi made of camel milk. The mouth-watering rasgullas from Chotu Motu Joshi sweet shop will sum-up your holiday with sweet memories. 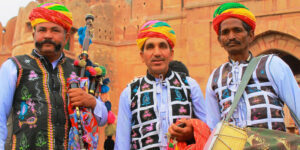 Rajasthan over the years has earned the status of being India’s cultural and festive hub. 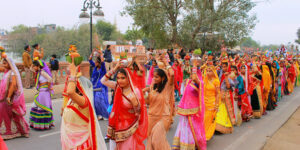 With festivals all year round, Rajasthan is always brimming with cultural activities & celebrations. The humble town of Bikaner will definitely impress you with its zest for life and the Camel Festival is just the perfect time to sink in to the spirit of the town making it a perfect weekend getaway from Delhi. LOCATION: Bikaner in Rajasthan DATES FOR CAMEL FAIR: 12th – 13th January 2019. 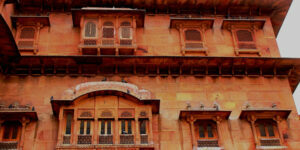 HOW TO REACH: (By Air) To reach Bikaner, the nearest airport is Jodhpur International Airpor at a distance of 235 Kms. (By Train) Bikaner is well connected to National Capital Delhi and State’s capital Jaipur along with other major cities. (By Road) Bikaner is well connected to every city in Rajasthan, Delhi and other important cities. Important distances: Bikaner – Delhi: 445 Kms. Bikaner – Jodhpur: 251 Kms. Bikaner – Jaipur: 335 Kms. Sudhakar Vasudev is a corporate professional who works for a Real Estate conglomerate in Noida. 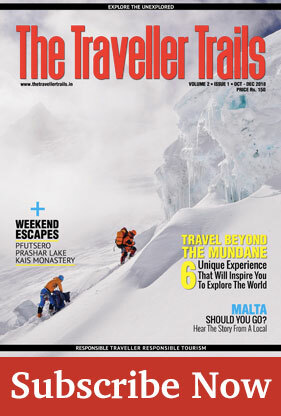 A hard-core travel enthusiast, Sudhakar has been travelling around the country for the last 7 years and particularly likes exploring mountains & off beat locations, savouring local cuisines & staying with the locals. With an inclination towards trekking & adventure, he has already completed several treks in the Himalayas, from high altitude group treks to solo monsoon jungle treks. When he’s not on the road, he loves to formulate travel itineraries & likewise loves to help others create memories.